Europa Casino Review 2019 - AU$2400 FREE Bonus! Europa Casino is not accepting Australian players for the time being. We suggest looking at Jackpot City, our #1 rated casino. If Playtech games are what you want, take a look at Casino.com. At Europa Casino, treating the customer right is a priority. That means superior software, games with great payouts, generous bonuses and loyalty rewards. 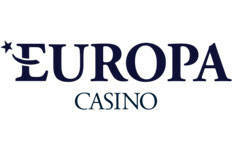 Europa Casino, one of several casinos owned by Imperial-E-Club, Ltd., has been a popular international online casino destination since 2003. Europa Casino, just like the name suggests, is very popular with Europeans. But you don’t have to live in Europe to play there. While this online casino is off limits to people in some countries, like the U.S., Australians are welcome! Of course, as you probably already know, there are hundreds of other online casinos where you can also play for real cash without a problem, so a natural question on your part might be why play at Europa Online Casino. This Europa Casino review will tell you. For starters, if you are a player who appreciates the finer things in life, including a casino that is tasteful and elegant rather than garish, we think you will especially like what Europa Casino has to offer. From the minute you log on and see the rich blue background and regal, yet inviting, atmosphere, you will feel that this is a casino you want to spend time visiting. More importantly, Europa Casino is not some newcomer whose trustworthiness is a mystery. It has been serving sophisticated, savvy gamblers like you from around the world since 2003. The casino is owned and operated by Imperial E-Club, Ltd, a name that may already be familiar to you because they also own several other quality online casinos, like Titan Casino and Casino Tropez. Furthermore, at Europa Casino, treating the customer right is a priority. That means superior Playtech software, lots of games with great payouts, and generous bonuses and loyalty rewards. Europa Online Casino, which carries licences from both Antigua and Barbuda and the UK, is truly an international casino destination. AUD is one of the many accepted currencies, and regardless of your preferred language and banking method, you can almost certainly count on it to be accepted as well. Europe is not exactly a hop, skip, and jump from Australia, so it may be a destination you might want to visit, but to which a trip anytime soon might not be feasible. So here is another idea. Save the travel time and airfare and experience a unique blend of old world European elegance and modern technology every time you make a virtual visit to Europa Casino! Practically every online casino offers its new real money players a Welcome Bonus, but not very many sweeten the pot with a big fat bonus keeps on giving, like Europa Casino. Also, unlike at some casinos, you do not have to make a gigantic deposit all at once on day 1 to reap the rewards. Naturally, the more real cash you deposit and play, the more you are rewarded, but at Europa Casino, the bonus-related deposits and playthrough requirements are spread out over a long period of time, so there is less strain on your bankroll. Here is how the Welcome Bonus, up to AU$2400 (or even more for high rollers), works. Blackjack Dos and Don'ts section contains erroneous information. As you will see, the Welcome Bonus at Europa Casino starts on day 1, but certainly doesn’t stop there. If you can make all of the specified weekly and monthly deposits, the casino is willing to give you an incredible $2,400 in bonus funds ($2,900 if your first deposit is $1,000 or more). However, there are important terms and conditions, and we would be remiss in this Europa Casino Review, if we did not point them out. Unless the website specifies otherwise, each bonus carries a playthrough requirement of 20x the bonus plus your associated deposit before any resulting winnings become withdrawable. Pokies, keno, and scratch cards all count 100% towards meeting these requirements, but other games contribute very little or not at all. This means, in effect, that most, if not all, of your qualifying play will need to be on pokies, but if you love playing the pokies, as most Aussies do, no problem at all. The 20x bonus + deposit requirement would ordinarily be quite reasonable and favourably compare to the Welcome Bonus offers at many other online casinos, except for one additional stipulation. The bonus itself is not withdrawable. What makes a sticky bonus not a great option for players is that as soon as the casino takes it back, the balance in your account goes way down. That is why casinos with this type of bonus almost have to keep the bonuses coming indefinitely to give you the incentive to keep reloading your account, as you would need to do in order to keep playing. At least, Europa Casino stretches out these bonuses (and associated deposit and playthrough requirements), so they are more wallet-friendly. But you still need to be careful. If you cannot afford the required real money wagering for $100 monthly deposits, deposit less and be content with smaller bonuses; the minimum deposit is only $25. You don’t have to be a high roller for Europa Casino to be a rewarding place to play, but if you are, this is one online casino where your high-end play will not go unrecognized. The rule of thumb at Europa Online Casino is simple: the more you play, the more the casino will reward you, and that applies not only to the Welcome Bonus, but to the casino’s loyalty rewards program, too. Much like at land-based casinos in Australia, all of your play earns you comp points, with your goal continually being to accumulate enough of those points so you can redeem them for real cash in your account. Different games allow you to earn points at different rates. Pokies are rewarded at the fastest rate. In addition, based on your play, you may qualify for membership in Europa Casino’s 6-level (Bronze, Silver, Gold, Platinum, Diamond, and Premier) VIP Club. However, if your first deposit is $1,000 or more, you qualify for VIP status immediately. The higher your level, the more you can expect back in return, as the additional bonuses and other rewards and perks extended to you keep getting bigger and better. . Premier players not only receive up to $250 in weekly bonuses, but a personal account manager, faster conversion of comps to cash, priority banking, and exclusive invitations to special events. Another way to snag extra bonuses is to “Refer a Friend.” Not only do you get $50 added to your own account for each friend who signs up and plays, but your friend gets $25 extra, too. Check the website for terms and conditions. Also, Europa Casino regularly offers other limited time only special promotions. These include additional bonuses, rebates on losses, freebies, etc. We suggest you check the website weekly so you don’t miss out. Whether your preference runs to pokies, or to video poker, traditional table games like blackjack and roulette, or any of the many other casino games, Europa Casino is loaded with entertaining possibilities. With more than 400 exciting games to choose from, including hundreds of varieties of pokies, even if you play every day, you will never be bored. Playtech, the name behind all of these games, specialises in both quantity and quality, and Europa Casino delivers nothing less. Your pokies choices probably include every variety of the game invented, from the simplest 3-reel machines to thrilling 5-reel video pokies packed with extra features like wild and scatter symbols, free spins, and bonus rounds where virtually anything can happen. And as if all that isn’t enough, more than 30 of the Playtech games offer you a shot at a mind-boggling progressive jackpot. Europa Casino is home to the famous Marvel games. Or, if you prefer, try your luck on one of the brand new pokies games. When you feel like switching to a different type of game, there are plenty of those, too. For example, you may be astonished at how many different ways this casino offers to play blackjack and roulette. And pokies are not the only type of game that utilises the latest advances in online casino technology to bring you a superior playing experience. There are table games that are so much like playing in a real Australian or European casino that is exactly where you will feel like you are. Check out the interactive TV games and live dealer games and see for yourself. You can choose any of three ways to access the games: Download, Instant Play Flash Version, or Mobile. Download is the best option if you would like full access to all of the games and if you expect to be playing on your own home computer a lot. This more flexible option allows you to play on any browser. No downloading is necessary, and you still have access to more than 100 games. The Europa Instant Play Casino is ideal for those of you who are on the go a lot because it is fully compatible with virtually any browser, including PC, Mac, and Linux computers. For the utmost in convenience and flexibility, choose Mobile. No need to worry about where you are going to find a browser connection because, with the help of the Europa Casino mobile app, you can take the fun with you anywhere on your smartphone or tablet. Unlike some apps, which are very specialised (i.e., work on iOS devices only and offer only a handful of games), the Europa Casino app works on both Apple IOS and Android devices and gives you access to more than 50 games. So take your iPhone, iPad, or Android smartphone or tablet with you and enjoy the fantastic convenience of anytime anywhere play. As a Europa Casino mobile player, you are eligible for the same big multi-part Welcome Bonus as computer players. You can also do your banking with the apps, using any of these six methods: Visa, Bank Transfer, Skrill (Moneybookers), Neteller, UKash, or Instadebit. If you use Skrill/Moneybookers or UKash, you get an extra bonus, just like computer players do. As a mobile player, you also get to choose from lots of great pokies games like Pink Panther, Captain’s Treasure, and the progressive game, Gold Rally. Blackjack, video poker, and scratch cards are available as well. The mobile app is very user-friendly, and with the handy on-screen guide, you should have no problems at all. Europa Casino caters to clientele from all of over the world and goes out of its way to make online banking as a hassle free as possible. AUD is accepted, along with USD, EUR, and several other currencies. In addition, you have a choice of more than 40 different methods you can use for depositing real cash to your account, most of which can also be used for withdrawal. See the list at the beginning of this Europa Casino Review, or if you have a different means of depositing in mind, check with Customer Support; it may also be accepted. With some methods, you even get a small (10 or 15%) extra bonus. Again, check with the casino. While some players have complained about slow withdrawals, the average time is within 4 business days, but faster for VIPs. Whatever banking method you use, protecting the privacy and security of all of your real money transactions is a priority. Even if English is not your native language, it is not a problem at Europa Casino, where 13 languages are spoken. For your added convenience, Customer Support is available 24/7 via live chat, phone, or email to answer any questions or concerns.